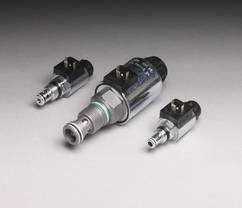 In a hydraulic unit, directional valves serve to guide the flow. Guiding means that it can ‘stop’ and ‘start’ the flow rate as well as ‘steering’ it. Electromagnetically actuated directional valves influence the path of a flowing medium. So, we use magnets for electrically-switched valves. It works via an electrical signal and displaces the control element via a magnetic field. What’s more, HYDAC offers direct acting and pilot-operated two-way poppet valves (WS and WSM) and direct acting spool valves (WK and WKM).